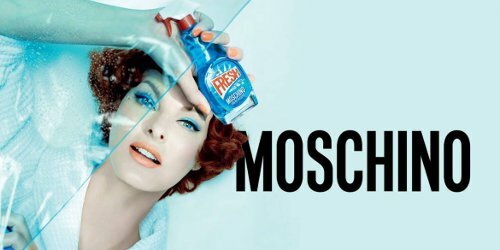 Moschino's new Fresh Couture is being billed as a "surprising and ironic" fragrance, and hey, just think of all the surprise and irony (and sure, irreverence, why not) you could pack into the Windex-inspired bottle! The possibilities were endless. The irony here, though, is that the juice hews as strictly to the basic tenets of modern mainstream perfumery as any you might find on the counters at Macy's, and indeed you would not so much as raise an eyebrow if you smelled it being sold under some other, less irreverent brand name, like Calvin Klein or DKNY or even Paris Hilton. In that case of course the bottle would not look like Windex, and the PR would be all about sensuality and strong, multi-faceted women, and the commercial would feature plenty of writhing and/or the clothing and cars and accoutrements of the 1%. Instead, we have Linda Evangelista doing a 1950s housewife,2 but either way, in the end, you get the same mix of sweet berries and non-descript florals. Surprise! Fresh Couture, the juice, mind you, is just fine. It's not as much fun as the clothes and the iPhone case, but it's fine. They're calling it a woody floral but it's a dead ringer for your average fruity floral. The opening is bright raspberry lollipop with some candied citrus; it's a wee bit shrill for a few minutes but it does settle. It's supposed to have ylang ylang and peony and osmanthus, and perhaps it does. It mostly smells to me like pink perfume flowers, liberally peppered — maybe the pink flowers in the blue bottle is the surprise? It's young and clean-ish and sweet, with a pale musky base (cedar, ambrox and what now passes for patchouli). Verdict: Whatever. If you love the bottle (and I do) you'll be happy to know that the juice won't kill you. But even within the confines of what they were trying to do — sell a lot of perfume to young people, presumably — they could have done better, and no perfumista will be swayed by the "so luxurious and haute couture"3 of the PR campaign. It does not smell like anybody spent a penny more on the raw materials than was absolutely necessary. My first thought on smelling Fresh Couture was that Moschino wanted to find its own Daisy, but hadn't quite hit the mark — I swear I had completely forgotten that the perfumer in both cases was Alberto Morillas. Anyway, Fresh Couture is reasonably fine but doesn't come close to the massive, multi-generational appeal of Daisy, and I have to say that while I really do adore the bottle4 — it would be hard to resist if I came across it in TJ Maxx for say, $9.99 — I don't forsee the same opportunity for the endless string of newly decorated flankers that the original (likewise adorable) Daisy bottle afforded. Perhaps they will surprise me. Moschino Fresh Couture is available in 30 ($45), 50 ($62) and 100 ($82) ml Eau de Toilette. It will be in much wider distribution than Toy, but is only just rolling out to stores (Bloomies in the US and Selfridges in the UK have it at the moment). 1. Quote via Women's Wear Daily, 10/27/2015. 2. And actually, I did not know she was supposed to be a "perfect 1950s housewife" until I read it in Women's Wear Daily. I thought she was just a woman cleaning glass in a bathrobe. Ibid. 4. Some of the 5 ml miniatures have turned up on eBay, and those are even more adorable. By the way, I think the original Moschino Couture! is highly underrated. It’s a fruity-floral, but a standout in the genre. 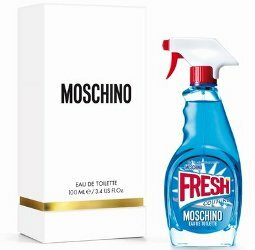 The very first Moschino men’s scent was very good, even though it was essentially a direct copy of Knize Ten, and the bottle was tremendous, a sort of pushmi-pullyu with a pour opening on one end and a sprayer on the other. I would not say no to a direct copy of Knize Ten. It would make me so happy if the flankers were done in other cleaning product vessels. A solid in a car wax tub would be awesome, and something in a dishwash detergent bottle, etc etc. I was imagining some Ajax copy bath powder in a canister shaker…. also Moschino, the first fragrance of the house is very very good. An oriental in the classic vein, think Shalimar and Bal a Versailles. I was so surprised when I smelled it and bought for a dime during sales. Damn. I wanted it to be good, either an interesting new take on fresh with elements of cleaning products (wintergreen, lemon, pine) or the jarring opposite, like an eighties floral oriental or something, the last thing you’d expect to find in that fantastic bottle. I’m not surprised, but I really am disappointed. That would be lovely but not expected. Frankly if they’d even done something as nice as Daisy I’d be pleased. But this is not exactly the best fruity floral money can buy — even the relatively little money they’re asking. This reminds me that Morillas also did Versace Versense, which could easily have been sold under the name “Fresh”! And I think, Versense is about as much as I would have hoped for here–I admire Moschino’s clothes, but the brand has not seemed like they make the same investment in the quality or creativity of their scents. What say you, is this Fresh better, worse or about on par with Versense? I think that was clear? I like Versense even though it’s not absolute genius and I wish it were a bit less clean. The Moschino is fine but I would not go so far as to say I like it. And I do like Daisy, even though I’m not dying to wear Daisy either (and if given the choice, I’d take Versense over Daisy, I think). I MUST have that bottle. Mom/Maid/Wife meets perfumista! The 5ml bottle will be a gracious plenty! If they want to do flankers of other kitschy bottles, I’m all in! Green bottles of Comet, yellow Pledge, orange Scrubbing Bubbles…..
Comet! That would be awesome. I’m just imagining the accompanying products… Bath oils or fizzers that look like those dish washer or laundry soap pods, body powder in those cleanser shaker containers, lotion in a dish soap bottle… They could put the whole gift set in a bucket and I might just have to buy it. Especially since I’ll confess that sometimes I want lollipops and candy, so instead of the calories, it’s fun to smell like sweets rather than eat them. At least that’s what I keep telling my waistline. Laundry soap pods — excellent! Instead of flankers they should really do a body care line with fantastic packaging. Hey, sometimes I want sweet too! But you must smell this — it is no Prada Candy. I do love the bottle, but I knew that the scent would be ho-hum. Given how much I love being right, I keep hoping one day that the pleasure I feel in being cynically right will somehow outweigh the disappointment I feel in the fragrance industry when they waste an idea like this, but… no. I’m reading a book on behavioral economics and now understand that it’s irrational but true that our losses are mourned than our wins are celebrated, even when you factor in the transaction utility. Just the word “behavioral economics” made my brain go entirely blank. All that remained was “I love being right too”. So instead I will tell you that I am reading Naples ’44 (you recommended it so long ago that you probably don’t even remember) and wow, I am going to have to read everything Norman Lewis wrote. I thought I had read something by him but now I am sure I was confusing him with someone else. Isn’t he fun? I just read “A Dragon Apparent” and that’s probably worth your time, too. Norman Douglas doesn’t look right either (just checked on Amazon). I may never know for sure because I am slowly clearing out books I think I will never re-read, so lots of stuff is gone, but I vaguely suspect I was actually thinking of Lawrence Durrell (Bitter Lemons, Marine Venus) which means the connection is a bit more tenuous (post-war // sunny places on water which I have never been to). Ooo, Bitter Lemons is good, too. I like Durrell (although I’ve never read the Alexandria Quartet, oddly), but I find I have trouble reading him seriously because I read Gerald Durrell’s memoirs first, and I can’t help thinking of Lawrence as pompous, volcanic, but ultimately charasmatic brother “Larry”, shouting about pigeons disrupting his manuscripts. Yes!!! And Gerald had a point (from Wikipedia: “As Durrell explains in his preface to Balthazar, the four novels are an exploration of relativity and the notions of continuum and subject–object relation, with modern love as the theme.”) I made it through Justine but faltered on Balthazar and gave the whole thing up. Oh, well have a look for Greene on Capri, which is by Australian writer Shirley Hazard. It’s a memoir of her friendship with Graham Greene when they both lived on or visited Capri in the 1960s. The opening is especially fun. Here’s the first chapter. I have read the Shirley Hazzard book & highly agree w/ the recommendation. Love her novels too, The Great Fire was fantastic. C.S. Lewis, Michael Lewis, Lewis Carroll…..can’t help myself. But Sinclair Lewis. Who I respect but don’t think is lovable. And not just waste an idea, but waste *Linda Evangelista*. There oughta be a law. How do you put this on? Does it actually use the red spray nozzle, or does the top pop off to reveal a more “standard” perfume nozzle? Either way, if I ever see this for cheap, I’m picking it up. The juice doesn’t sound like my thing, but what a great addition to my bottle collection! I have a sample (also cute packaging) but my understanding is that the red cap comes off. Ha. An entertaining review for what sounds like a boring perfume. I first heard of Fresh Couture on facebook, where a friend (who has zero interest in fragrance) wrote something snarky about how now the market is trying to sell us perfume in a Windex bottle for $80. My first thought was “only $80?” I mean really, especially for 100 ml. LOL — so so so true. I was pleasantly surprised by the prices, so at least they are not gouging, so long as you calculate via perfumista math. I mean, they’ve managed to keep the 30 ml under $50 w/o using a different bottle, as they did with Daisy. Ah, interesting. IIRC, that one was lighter but sweeter and fruitier than Daisy, and I didn’t like it as well. Would be interesting to smell this one next to that. I am sort of surprised I’ve never bought any version of Daisy. I suppose I am more impervious to vinyl flowers than I thought. Then again, the game is not over! I bought the original Daisy, too, and got bored after a few wears. I think I ended up selling the bottle. I find it ironic that when I had a few bottles, I never dithered over selling and now that I have a lot more, I have not been compelled to sell. I do need to cull the herd but it is much easier to just give them away! Oh, I can’t imagine keeping any interest in wearing it, I just think it’s a great bottle. They’ve done so many of them now though that maybe it’s lost its punch. Is there room for another odd duck? That bottle would taunt me endlessly: “Clean the bathroom, clean the bathroom.” Kind of like the beating of the telltale heart. Ha! Just so! Welcome to the Odd Duck Club ???? Poe would be proud! Ha, I have moved past both of you: I’m a poor housekeeper but have no guilt. Even my Windex bottle has given up and has nothing to say except “oh well, eventually”. But also, don’t think you’re the odd duck. Lots of people hate it. I started scrolling through the twitter of young Jonathan Azara (your link to the photo of the mini) and was amused by the photo of him trying on a hoodie. This being Italy, land of la bella figura, the hoodie hangs perfectly and looks impeccable. Holy cow, had not looked at his feed at all. He got a 1992 Holiday Hostess Barbie for Christmas! Lush’s Dirty body spray has a similar bottle, but its black and plastic… I have to admit to liking this one more. Yes — and ages ago, Diesel had a line of fairly decent perfumes in spray cans, although those looked more like they were for bug killer or pesticides. This one is way better! Love the ad, love the bottle, not interested in the juice. Moschino Funny is good though, a great summer scent. And such a great name! The first Moschino for Men, Moshino Pour Homme, is exquisite. I have a little of a quarter bottle left. To me it smells mostly of coveted real carnation and it’s so lovely people constantly compliment me when I wear it. I paid an arm and a leg for the 3.4 ounce bottle and I am trying to decide if I need buy need to purchase it again. It’s such an amazing fragrance but I held out for 5 years before breaking down and buying another original vintage bottle again so it may be very well be another 5 years before the purchase. The current collection of fragrances is too large again, and like my coveted Pontaccio 33, I need to finish up some of what I have before adding more to the inventory.